The news has been filled with the recent recall of a half a billion eggs. That's BILLION. In large factory farmed plants, chicken are crammed in tiny cells, they never see the light of day, they never move, they eat inferior food and that's just the beginning. At Doe Run Farm, our chickens roam the farm on sunny and not so so sunny days. They have their choice of lovely grubs and worms they scavenge as well as a balanced diet filled with fruits, vegetables and whole grain. ...we get their lovely eggs. 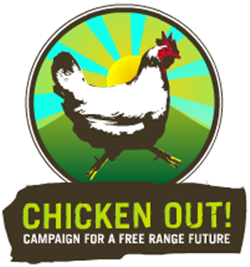 In England, cookbook author and writer Hugh Fearnley-Wittingstall started Chicken Out, a campaign to encourage free range farming of chickens. In the U.S. the USDA requires that in order to be "free range" outdoor access must be made available for "an undetermined period each day." In other words, the farmer can open a little door for a few minutes a day and call his eggs "free range." Seriously, felons in super-max prisons get more time outside than "Free range" chickens. Please, ask questions about your food. Nearly 8 eggs in 10 are produced by 4 companies. While that egg carton in the grocery store may have a different name, chances are all those eggs came from the same basket. Please, buy your eggs from a farmer, not a factory farm. Few things are as soothing as watching the girls take a dirt bath and sun themselves. Except when they are singing in the twilight. is a sin the way they treat them. My husband handled a few law cases with the chicken farmers in Maine. Hey, looks like your chickens have a lovely home to live in. Nice photos. Just wondering what breeds you have, there are some pretty girls there. Settled in nicely, feathered up beautifully and are good layers. The girls are Ameraucanas and Iowa Blues. The Blues lay brown eggs and the Ameraucanas the others. Such an important message to say.